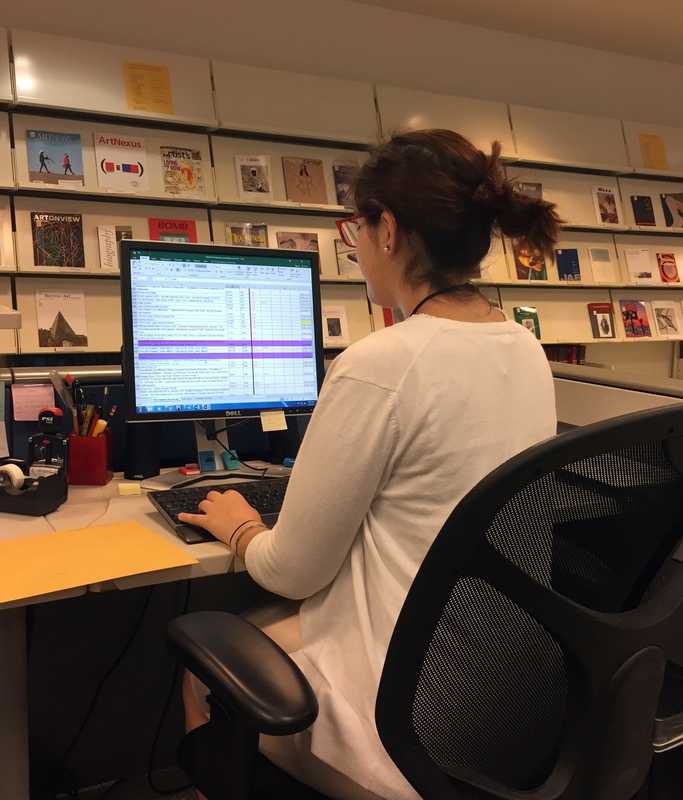 The Smithsonian Institution has been digitizing books from the Libraries collection from the World’s Fairs, and I began the process of finding titles that had not yet been scanned. This involved searching the library catalog for possibilities, comparing the list to what had previously been scanned, and then making notes as to their copyright status. It all sounds pretty straightforward, until you get into international waters — that is, what are the copyright rules for international publications being digitized in the US? The United States copyright policies are complicated enough. After a bit of research, I found that many publications for the World’s Fairs, especially those held internationally, were not copyrighted by their publishers. I believe that less than 200 of those items deemed eligible for digitization are subject to copyright, most of those from 1939 to present. My favorite part of the project was the organization. 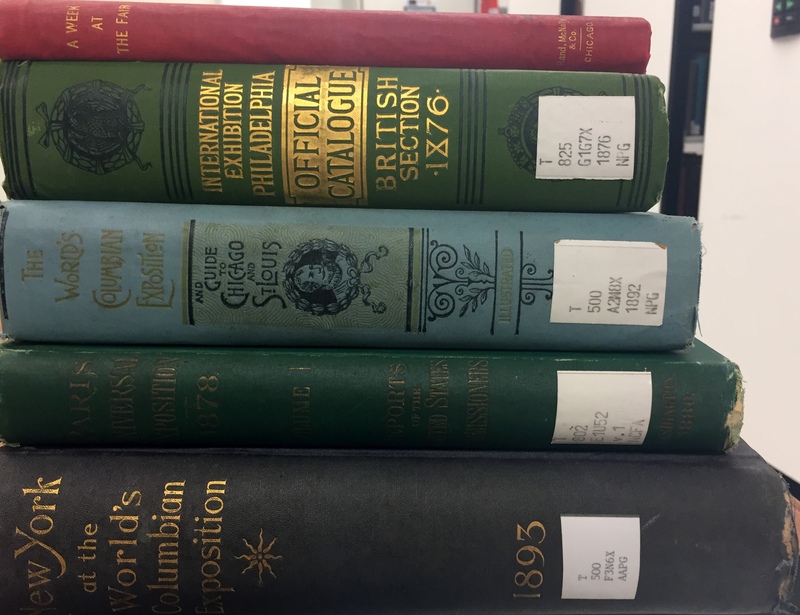 I began with trying to find subjects in the Smithsonian Libraries collections relating to the World’s Fair and International Expositions, and organized it ascending by date, then title, then location, then individual bibliographic number. From there, I color-coordinated the titles based on their entries in the library catalog for the type of material: from the American pavilions, official materials like guides and maps, photographs and musicals, and reports about the planning before, during, and after a specific World’s Fair passed. The individual libraries where the artifact is currently located were also color-coordinated to visually show where the majority of our items were, in this case a tie between the Cooper Hewitt, Smithsonian Design Museum Library and Dibner Library of the History of Science and Technology. After this list was finalized, I created a separate sheet to compare it against the list of World’s Fair items already digitized, and removed those to create an up-to-date master list to find the copyright information pertaining to those left. The best part of every project I have had this summer is that even if I didn’t know much about the topic before I began (which was quite often the case), by the end I knew quite a bit of trivia about my favorite artists. I knew very little of the World’s Fairs, or that they were also called “international expositions,” before going into this project. I also knew little to nothing about copyright, and now I know that everything before 1955 is public domain in Australia. I don’t speak any French, but quite a few French websites helped in determining copyright simply by narrowing down which edition matched the one that the Smithsonian had. 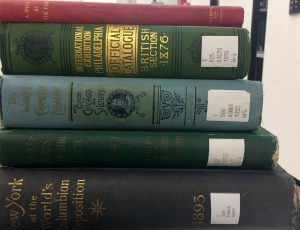 We have quite a few of the World’s Fair items at the AAPG Library; mostly catalogs from different countries’ sections of the World’s Fair that have whimsical covers. The most interesting title that I found was Truth Prevails: Czechoslovakia Will Rise Again as that is the one I most want to look at.